View of “Hella Gerlach: paradise garage,” 2015. From left: Cremona (Kopfüber), 2015; Satellite I, 2015; Satellite II, 2015. Viewing Hella Gerlach’s exhibition “paradise garage” resembles a spiritual exercise. In an effort to unlock the individual works and installations via their titles and configuration, linkages appear on divergent levels. 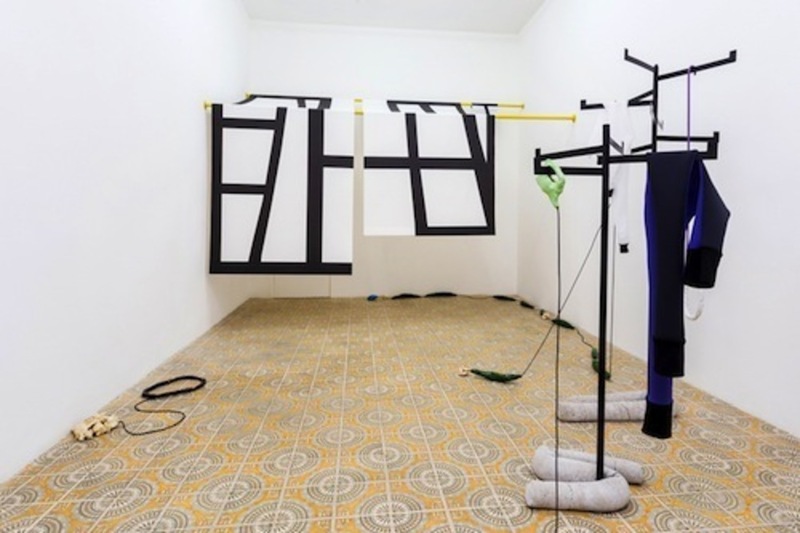 Cremona (Kopfüber) (all works cited, 2015), for instance, extends through the space like an awning held up by two sulfur-yellow poles, which are mounted between two walls. The black bar pattern on its fabric is reminiscent of the facade structure of traditional wooden-frame houses commonly seen in historic city centers or suburbs of Germany. This architecture is based on the mathematical system of Luigi Cremona, who promulgated the formula that balance arises at every junction of a built wooden framework through the push and pull of forces exercised. Gerlach translates this principle of construction into social structures, which are also ordered by the exchange of different, more emotional forces—whether within the family unit or otherwise communal spaces. Two installations, Satellite I and II, present the most concrete approach to this notion of structural elasticity. These metal sculptures rise out of concrete bases and branch out into new bifurcations, suggesting an equilibrium of forces. The dominant note, though, is carried by two individual works, Nervenkostüm and Nervenkostüm (Timeless Light), which are made from neoprene, and Nervenkostüm is draped over the first Satellite. In this display, the fabric’s weight suggests a mental state. Throughout “paradise garage,” Gerlach creates a multifaceted representation of collective realms of experience, in which inside and outside are connected through a subjective and rather personal perspective.